A leopard cub was seen in the wild nature in Azerbaijan, the Azerbaijani Ministry of Ecology and Natural Resources. In October 2018, photo and video traps captured a female leopard with a calf in the Zangezur National Park named after Hasan Aliyev, located in the Nakhchivan Autonomous Republic. Technical equipment for tracking the population of wild cats has been installed as part of a joint project of the Ministry of Environment, the public association IDEA, and the World Wildlife Fund (WWF). The growth of the leopard population indicates an increase in their forage base, which, in particular, includes such animals as bezoar goats and mouflon, follows from environmental data. In addition, the explanatory work carried out among the population and the organization of the specially protected territory also had a positive effect on the growth of the number of leopards. Since the 20th century, the leopard is listed in the Red Book. In Azerbaijan, these wild cats inhabit the territory of the Hirkan and Zangezur national parks. At the same time, animals periodically migrate to Turkey, Georgia, Iran and Armenia. 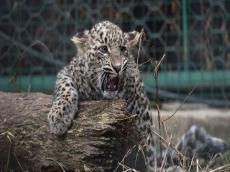 Azerbaijan and Russia plan to create a reserve for the restoration of leopard population in the Caucasus in the near future. The reserve is proposed to become a part of Zagatala State Nature Reserve (Azerbaijan) and Federal Reserve Tlyaratinsky (Republic of Dagestan). With the aim of protecting and increasing the number of wild nature, Azerbaijani IDEA Public Union identified the Caucasus Big Five project which envisages protection of the Caucasian leopard. As part of the “Protection of Leopards” project, IDEA jointly with local and international organizations, held various events aimed at public education, including summer camps, scientific seminars and workshops for students, as well as youth competitions.